An aneurysm is a ballooning or dilatation of an artery. This can occur in any artery but overwhelmingly occurs in the aorta, which is the main artery in the abdomen. The dilation weakens the wall of the aorta and can end up rupturing, resulting in catastrophic bleeding. The risk of rupture increases with the size of the aneurysm. In the majority of circumstances they do not cause any symptoms and are only picked up when you have a scan. If they do cause symptoms it usually suggests there is a high chance of leaking or leaking has already occures. It can cause pain in the abdomen often going through to the back. It can cause giddiness and blackouts. Ff you know you have an aneurysm and this happens, call 999. What are the chances of leak or rupture? This depends on the size. If it is less than 5.5cms then the risk of rupture is minimal <1% /year. If it is over 5.5cms, then the risk is about 5-10%/year. If it is larger the risk increases exponentially. Over 6cm it is about 10-20%/year and over 7cm it is >30%/year. There is currently an aneurysm screening programme for men when they reach 65. You will be invited to attend for a scan when you turn 65. The likelihood of having an aneurysm below 65 is very low. The likelihood of an aneurysm in women is also very low. If you have a family history i.e. >2 members of immediate family, then you can have a scan earlier. If you already past 65 then you could request a scan in the screening programme through your GP. You may have already had a scan of you’re abdomen for other reasons and an aneurysm may have been ruled out. There is very little you can do to affect the aneurysm. 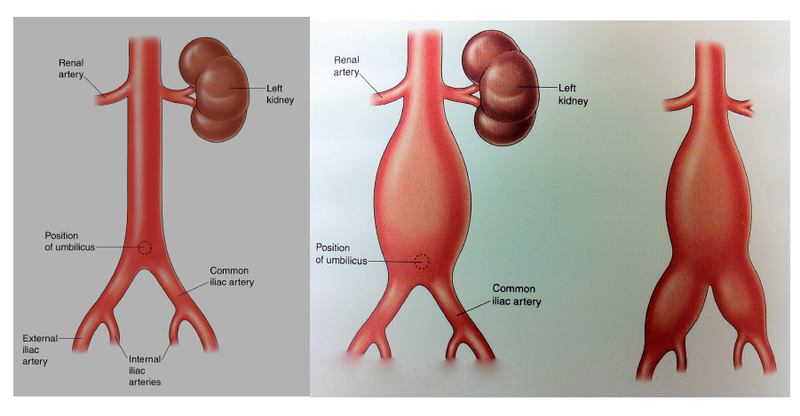 When they are small, aneurysms generally grow very slowly. If you have an aneurysm, you will be invited for a regular scan, generally once a year. When the aneurysm grows beyond 5.5cms, you will be referred the vascular surgeon for further tests and planning treatment. The best way to help yourself is to not smoke and make sure your blood pressure is normal (140/90 or below). 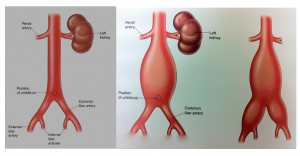 What are the risks of aneurysm surgery? The immediate risks of surgery are higher with open surgery than with Endovascular repair (EVAR). Open surgery is associated with a risk of death (5-8% ) within 30 days of surgery. With EVAR, it is 1-2%. However, after 2 years an equal number are alive whether one has open surgery or EVAR. The risk of requiring further procedures with an EVAR is much higher (around 15%) compared < 1% for open surgery. The major complications that we look out for are heart attacks, pneumonias, kidney problems, bleeding and circulatory problems in your legs. While other complications can occur they are uncommon.